A thousand visitors over two days, a queue out into the street and a fantastic mix of people intrigued and excited by our project … our participation in Open House London was definitely a success! We were thrilled when our experimental textile house in Brackenbury Road, west London, was selected for what is the capital’s largest annual festival of architecture and design, taking place every September. The project was even featured on LBC Radio as a highlight of Open House weekend. The front door was thrown open to the public so that visitors could explore one of our most inventive pieces of work, a townhouse that interweaves architecture and textile installations to celebrate the story of a family of drapers who lived there 100 years ago. 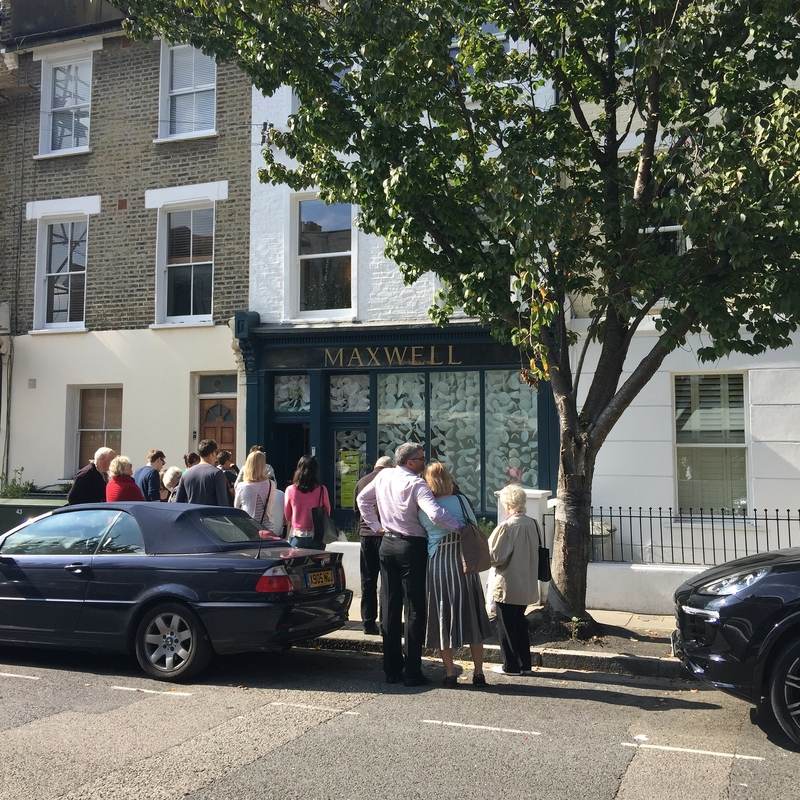 Our Open House experience was extremely positive: from the amazing generosity of our clients who opened up their home, greeted visitors and gave guided tours, to the Open House volunteers who made it all so easy, to the wonderful feedback. Brackenbury Road was a finalist for the acclaimed Architects’ Journal (AJ) Retrofit Awards as among “the best work and the brightest thinking” in Britain. It is a superb example of our work with creative collaborators, in this case the textile artists Anna Glover www.annaglover.co.uk and Deepa Panchamia www.deepapanchamia.com whose gorgeous fabrics flow through the building. 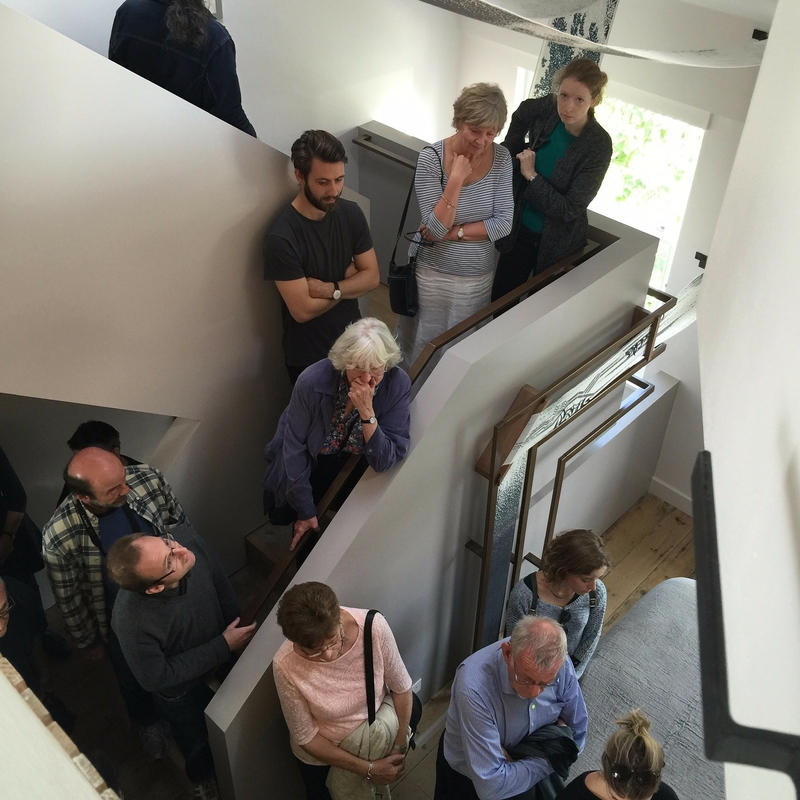 Visitors were fascinated by how we had transformed a relatively modest townhouse – by the quality of light, by the materials used and by what was done with them. They were also impressed by a contemporary response that was warm and approachable rather than cold and sterile. 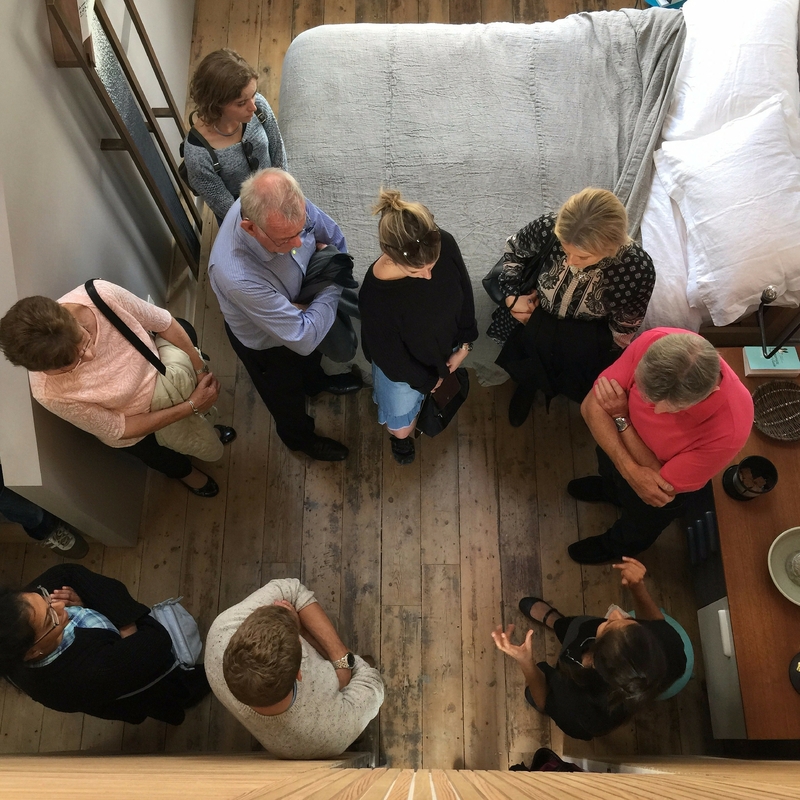 Those who visited included neighbours and local residents, architecture fans and Londoners on the Open House trail: people from all walks of life and of all ages. Architect Patrick Lewis gave a talk about collaboration and Anna and Deepa spoke about their work. Anna’s Brackenbury pieces reference the draper and his wife through jacquard printing and the dyes and pigments of organic chemistry, with two interlinking lengths of material cascading from top to bottom of the house. Anna specialises in “distinctive interior pieces for those drawn to the beautiful and unexpected” and describes her work as “playful yet sophisticated”. Deepa is a British artist based in Finland whose tight design style creates cocoon-like structured fabrics of beautiful flowing light silk. Her piece gives another member of the family a place in the building’s contemporary life. Deepa specialises in “one-off, handmade architectural and sculptural textiles for interior spaces and sculptural wearable art for performance artists”. Read more about Brackenbury here. We’d certainly recommend Open House London. It is a fantastic opportunity to go behind the secret door of the city, visiting prestigious historic buildings and unique new architecture normally closed to the public. Looking back, it provided us with a natural point to celebrate the completion of the Brackenbury Road project.